For example, the rose quartz crystal is used to attract love and romance, as well as heal a broken heart. 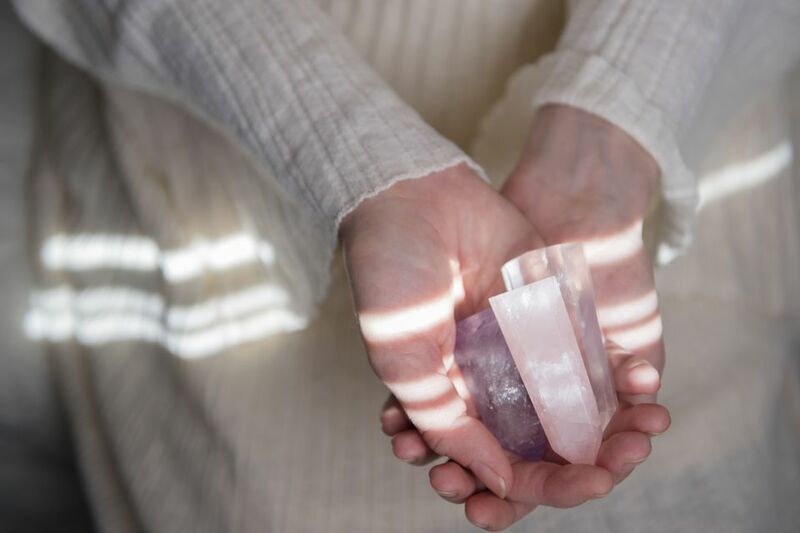 The rose quartz crystal emanates specific frequencies that promote heart healing. Black tourmaline and hematite have strong protective energies, while citrine helps heal self-esteem issues, as well as attract wealth and abundance. Two rose quartz hearts are often placed in the southwest feng shui area of the home to promote happy energy in a love relationship. Often a full bowl of rose quartz crystals is placed in the bedroom as a feng shui love cure. If your child has trouble concentrating and tends to get overexcited, several pieces of hematite will help ground and center his or her energy. You can place them either in your child's room or in the west (children and creativity) feng shui area of your home. Tumbled hematite is often used in feng shui for grounding and centering energy, as well as for protection. A good feng shui use of the black tourmaline, obsidian, and hematite is by the front door to benefit from their protective qualities. You can place several tumbled hematites or black tourmaline stones either outside or inside your front door in a visually pleasing way. For example, if you have big pots with plants on both sides of the main door, you can place the stones on top of the soil or at the base of your plant pot. Blue kyanite and citrine are the two crystals that never need cleansing as they do not absorb negative energy. You can use blue kyanite for protection and relaxation/stress relief, while citrine is one of the classical feng shui cures to attract wealth. You can strengthen the healing energy of blue kyanite by using it - be it in jewelry or in decor displays - with a clear quartz crystal. The abundant energy of citrine can be strengthened by using it with rich fiery color stones such as carnelian, red agate, jasper, and tiger's eye. It is best to cleanse the crystals when you first buy or receive them as a gift. Crystal cleansing resets their vibration to be receptive to the new home and the new owner. Crystals should be cleansed regularly, as well as treated in a respectful and loving manner. You can cleanse crystals in many ways, from submerging them in pure water (with or without salt) to smudging them during your space clearing sessions. Be sure to place your crystals in good energy areas, such as your dining, living room or main entry table, your bookshelves and, of course, your altar. Learn more about the feng shui properties of crystals and stones and bring some crystals into your home. Most crystals are very affordable and easy to purchase either online or in numerous gift stores and bookshops. When purchasing crystals for feng shui purposes, be sure to ask if the crystals have been radiated (this treatment diminishes the healing power of crystals and stones). Gift your home with at least a few natural crystals and stones. After all, you and your family will be the ones to benefit from their healing energies.